On Nov. 13, when the Kansas State men’s basketball team destroyed Alabama-Huntsville by 61 points, the largest margin in Bramlage Coliseum history, Chargers coach Lennie Acuff said something profound. The night before that 87-26 defeat by the Wildcats, Alabama-Huntsville gutted out a 78-75 nail-biter against North Texas that came down to free throws. The parallel between what happened to the Chargers between Nov. 12 and Nov. 13 and what happened to the Kansas State football team just a few days later is an easy one to draw. Last Friday, the Wildcats only need to win out, and they have a clear path to the national championship, which would be the first time ever a Kansas State team would play for the BCS title. By Saturday night, those hopes were all but dashed after the Wildcats were defeated handily by Baylor, a team that entered the game with a losing record and whose only conference victory came against KU. So much emphasis is placed on sports these days, and central to that is an emphasis on winning. There is nothing wrong with that. Still, it is important to remember that a W-L record is not what truly defines an individual. Not even close. Deep down, most people understand that, and it is a testament to coach Bill Snyder and the Kansas State football program that when asked about Thanksgiving on Tuesday afternoon, many players seemed to have a very firm grasp of that reality. Needless to say, no one mentioned the W-L record. Not more than a month again, I wrote an article for the Associated Press about how running back John Hubert does so much to get Kansas State down the field but rarely gets to be the one to take the ball into the end zone. It appears coach Bill Snyder has set out to prove that story incorrect. Through five games, Hubert now has eight touchdowns, including four on Saturday in the Wildcats’ rout of Kansas. In 2011, Hubert scored just three times despite racking up 970 yards of offense. With more than twice as many touchdowns as last year , Hubert is on track to blow away his previous yardage numbers as well. He has already amassed 527 yards on 76 attempts, averaging 105.4 yards per game and 6.9 yards per carry. Currently, the 5-foot-7 Hubert is among the top 30 running backs in the country in yards, yards per carry and touchdowns. He does not get nearly as much press as quarterback Collin Klein, but with his running style and his blocking ability, he is definitely an integral part of the Wildcats’ offense. 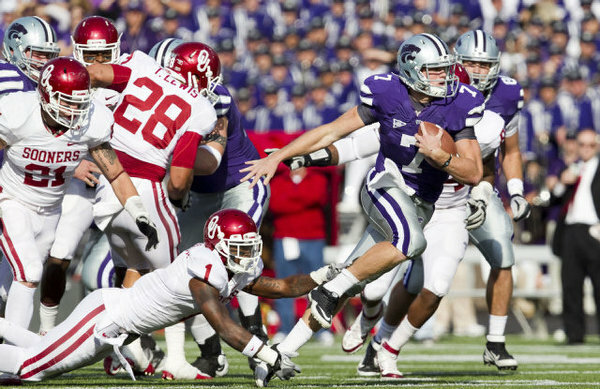 Quarterback Collin Klein and the Wildcats outran the Sooners on Saturday night, flourishing yet again in their underdog role. In the last couple seasons, fast-starting Kansas State teams encountered what some would consider harsh reality checks – a 58-17 defeat by Oklahoma in 2011, a 48-13 whooping by Nebraska in 2010. This year, it looks like no one is stopping the Wildcats. That idea gained significant credence Saturday night in Norman, where Kansas State won, 24-19, for the first time since 1997. Oklahoma coach Bob Stoops was 14-0 against ranked teams there going into the game against the 15th-ranked Wildcats. Kansas State knocked off the Sooners for the first time since 2003, so this win is clearly one that will stick with the program for years to come. Though the current players only get to enjoy the warm, fuzzy feeling for the next 24 hours or so, the longer-term effects of such a victory are not going anywhere. On Saturday the Wildcats’ offense continued its trend of finishing strong, scoring 10 points in the second quarter and 14 points in the fourth. The Kansas State defense held the Sooners to one score per quarter – a field goal in each segment of the first half, a touchdown with the extra point in the third quarter, and a touchdown sans two-point conversion in the fourth. Flashy plays are what make the highlight reels, but the proper execution of fundamentals ended up being what won the game for the Wildcats – and what lost it for the Sooners. Oklahoma quarterback Landry Jones fumbled and threw an interception, while backup quarterback Blake Bell also fumbled. Kansas State took advantage of the extra opportunities and offered none to the Sooners in return. By my count, the Wildcats allowed 14 passing plays of 10 yards or more. That number still sounds a bit high, but in fact, that stat is 44 percent lower than what Kansas State gave up to Oklahoma last year – 25 such plays. Also, the Wildcats sacked Jones, forced a fumble by him and intercepted him. Troubling for the Sooners and confidence-inspiring for the Kansas State is the fact that the Wildcats converted in seven third-down situations. Two of those came during the final drive of the game and were essential in allowing Kansas State to run out the clock and keep the ball out of the hands of the Oklahoma offense. The Sooners finished with 386 yards of offense, but the Wildcats nearly equally that total with 362. Moreover, Kansas State actually displayed a much more balanced attack than Oklahoma, who relied on passing for over two-thirds of its yardage. The Wildcats rushed for 213 yards and passed for 149. Hubert went for 130, racking up plenty of those yards after contact that make him so valuable, and Klein added 79. Both found the end zone on the ground. Through the air, Klein completed 13 of 21 passes, spreading the ball around to six different targets. Kansas State returned to its normal occupation of ball control specialist, retaining possession for 34:37 compared to 25:13 for Oklahoma. The win lifted the Wildcats to 4-0 on the year and 1-0 in Big 12 play. Certainly, it was a heck of a way to kick off the conference portion of the schedule. For their part, the Sooners seemed stunned. The Wildcats will have to move on as well, but surely, they will do so a bit reluctantly. Saturday is a night they won’t soon forget. Kansas State found itself at a crossroads going into last season’s Miami game, and this season the situation feels similar. Although the No. 21 Wildcats defeated Missouri State 51-9 in their season opener, the score did not tell the whole story – not even close. At halftime, the ball game that should have been a blowout was tied at 6. Kansas State did not score a touchdown until midway through the third quarter. That it took the Wildcats so long to get to full throttle did not please coach Bill Snyder. He made it an emphasis throughout the offseason that the team needs to get going faster this season after winning eight games by a just touchdown or less last year. His frustration was evident in a sarcastic statement after the game. Kansas State started the 2011 season slow as well, just barely scraping by Eastern Kentucky, 10-7. Though they defeated Kent State 37-0 the next week, the Wildcats had given credence to the prediction that they would finish eighth in the Big 12. 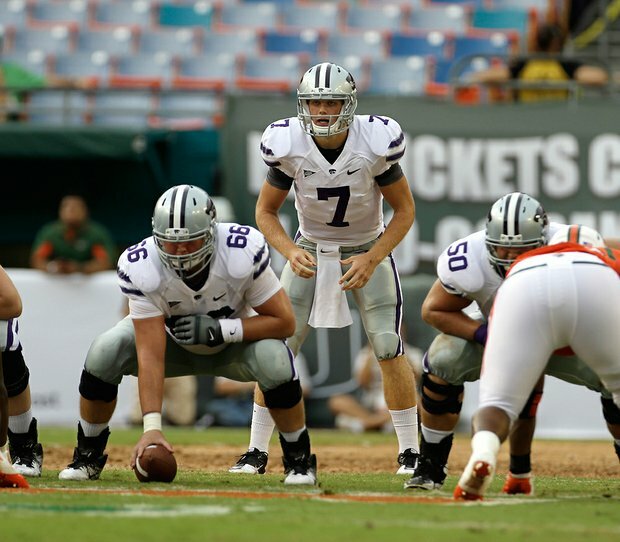 When they went on the road to Miami, Kansas State had a lot to prove. The same is true this year. The Wildcats’ secondary struggled in 2011 to contain the high-octane offenses of the Big 12, and after losing safety Tysyn Hartman and cornerback David Garrett, the unit looked vulnerable again on Saturday night. Missouri State scorched Kansas State for 323 yards through the air. The team averaged just 176.2 passing yards per game last season, but it had nearly that amount by halftime against the Wildcats. Offensively, Kansas State failed to score touchdowns several times when it got in the red zone. Kicker Anthony Cantele got a significant amount of practice in the first half, going 3-for-3, but obviously field goals are not going to cut it going forward. Mistakes were made, but the Wildcats are moving on. Their experience against the Bears could help them with more than just getting first-time jitters out of the way. The no-huddle offense Missouri State runs gave Kansas State real-time practice against the sort of offenses they will see all season long. Miami will be another test in that regard, a higher-level one. It is a valuable opportunity for preparation considering the Wildcats do not have the tools to replicate the speed of such offenses by themselves in practice. In fact, linebacker Arthur Brown said the coaching staff this season has used a new technique to get the Kansas State defense accustomed to the reactionary nature of playing against no-huddle offenses. The defense has to turn its back to the play, and then when the whistle blows, the offense is already set up and the defense has to scramble to get into the correct formation. 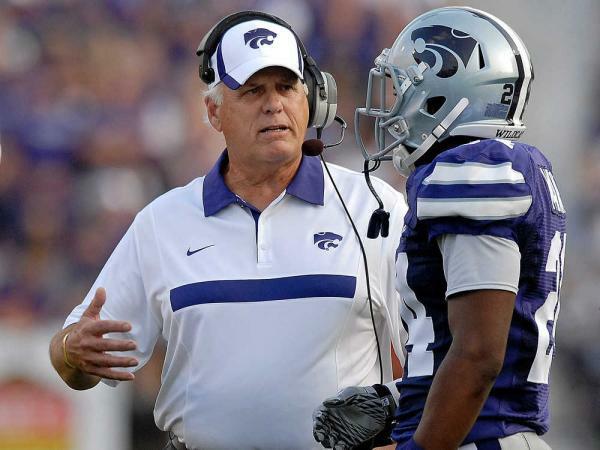 Though the high-tempo offense is not something Kansas State has adopted, the system has its advantages. Against the Hurricanes last season, the Wildcats held a 28-24 lead going into the final minutes of the game. Miami had first and goal at the 2-yard line. Kansas State kept the Hurricanes out of the end zone four straight times, recording a valiant goal line stand that Brown called the defining moment of the season. This Saturday will mark the first time ever that Miami has visited Manhattan, and the Wildcats hope it will be another one to remember. The consensus among the Baylor Bears after losing 36-35 to Kansas State on Saturday night was that the Wildcats did not beat them as much as they beat themselves. That’s a common refrain among teams. It’s not necessarily an inaccurate one, depending on the situation, but this time I disagree with the assessment. Give credit where credit is due: Kansas State – and its defense in particular – bent but did not break and consequently defeated Baylor. Going into the matchup, junior quarterback and early Heisman candidate Robert Griffin III had 13 touchdowns and 12 incompletions. His offensive line had allowed only three sacks over the course of three games. He throws 30- and 40-yard passes as effortlessly and accurately as if they were little dinks to the sideline. Throughout his career, his touchdown-to-interception ratio is nearly 5:1 – 59 touchdowns and 12 interceptions, and he holds 42 records at Baylor. This season in particular, his numbers just boggle the mind. Yet the Wildcats sacked Griffin five times and hurried him into eight incompletions and an interception. He still passed for 346 yards and five touchdowns, so if this were any other quarterback, the conversation would be what a fantastic game he had. It was a great performance, but it wasn’t enough. In my opinion, that’s much more of a reflection on Kansas State than it is on Griffin. The Wildcats got past the Bears’ hulking veteran offensive line and snuffed Griffin out time and time again. They pressured on him, and while he still completed the vast majority of his passes, he looked a bit rattled. At one point he fumbled without being touched by anyone. 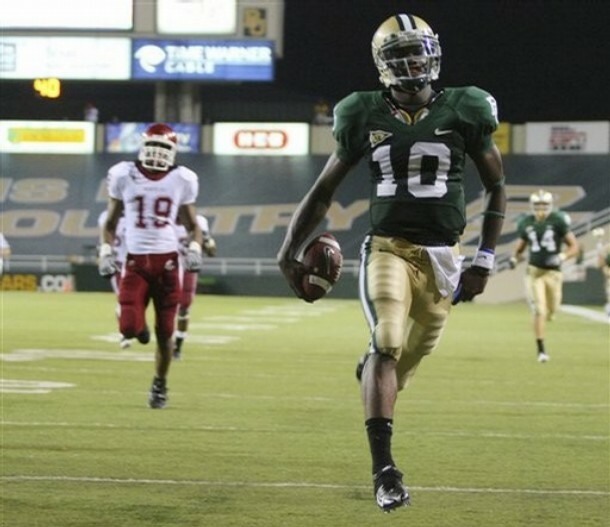 Even though he torched the secondary for four touchdown passes of more than 30 yards each, he and Baylor as a whole could not cash in on their longest possession of the game, when they spent almost twice their usual drive time (about four minutes) getting down the field only to miss a field goal. For the final piece of evidence that 1) the Wildcats contained the Bears and 2) the Kansas State defense is a whole different animal from last season, consider this. Last year, Baylor hung a school-record 638 yards of offense on the Wildcats. In this year’s game, they only amassed 429. For some reason, no one wants to admit that this Kansas State defense has some serious heart and even some pretty impressive talent. People were skeptical as the team went to Miami, as the team returned to face Baylor, and some are questioning even now, with Missouri coming in this weekend. I’m not sure what will convince everyone that this is a good defense … except, of course, one more win. But really, that’s okay, because that’s all coach Bill Snyder wants his team thinking about anyway. 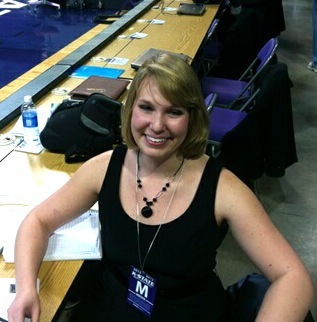 For more conversation about Kansas State and Baylor, check out my appearance on the Pulse Network with Tyler Pyburn. Mention of the last game between Kansas State and No. 15 Baylor likely makes Wildcat fans cringe and Bears fans fondly reminisce. Baylor hung a school-record 638 yards on Kansas State that day, giving Waco a 47-42 happy ending to Homecoming Week. A little less than a year later, the Bears still terrorize defenses. When they come to Manhattan on Saturday, however, the defense across the field (currently ranked No. 6 in the nation) from them probably won’t look very familiar. With so much having changed from last year to this year, it’s anyone’s guess what will happen in this game. That said, here are some stats that tell you what’s happened to Baylor before during the tenure of coach Art Briles.